I wanted to call this “Odds and Ends Cobbler” but I didn’t want to put anyone off with such a strange name. The recipe I used was originally called “Blueberry Cobbler”, but since less than half of the fruit I had was actually blueberries, I didn’t really think that made much sense. (Side note: All the blueberries came from my bushes! Yay for summer fruit!) I had a carton and a half of Rainier cherries, a handful of raspberries from the yard, a pint of strawberries from the farmer’s market, and a fair sized bowl of blueberries that I had recently picked. My recipe called for 30 ounces of blueberries, and I ended up with 28 ounces cobbled together (No pun intended. Oh, you know you want to laugh at that.) from my various shopping/picking excursions. I was very happy with the recipe… It was easy to put together and the biscuits were amazing. The cinnamon sugar on top gave them just the perfect amount of sweetness and crunch, and I think it’s safe to say that we’ll be eating some version of this pretty regularly for the next several months. Oh, by the way, I’m now totally into instagram. Join me, it’s awesome. 6 cups (30 ounces) fresh blueberries, rinsed and picked over, or equivalent of whatever fruit you have. For the filling, stir the sugar, cornstarch, cinnamon, and salt together in a large bowl. Add the berries and mix gently until evenly coated; add the lemon zest and juice. Mix to combine. Transfer the berry mixture to a 9 inch glass pie plate or 8 inch square baking dish, place the plate on a rimmed baking sheet and bake until the filling is hot and bubbling around the edges; about 25 minutes. For the biscuit topping, whisk the flour, cornmeal, 1/4 cup sugar, baking powder, baking soda, and salt in a large bowl to combine. Whisk the melted butter, buttermilk and vanilla together in a small bowl. Mix the remaining sugar and cinnamon in another small bowl and set aside. One minute before the berries come out of the oven, add the wet ingredients to the dry ingredients and stir until just combined and no dry pockets remain. 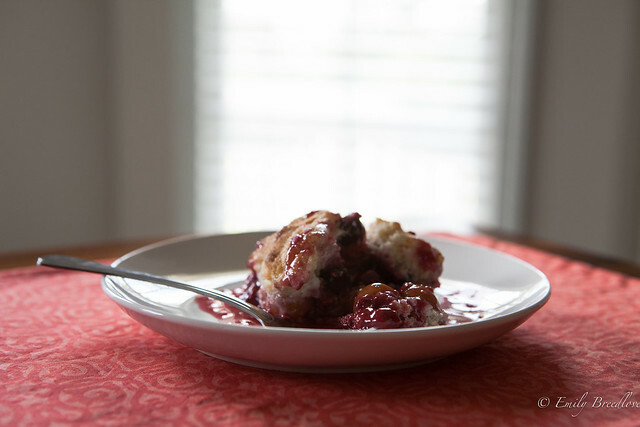 Remove the berries from the oven and increase the oven temperature to 425 degrees. Pinch off 8 equal pieces of biscuit dough and place them on the hot berry filling, spacing them at least 1/2 inch apart so they do not touch. Sprinkle each mound of dough with the cinnamon sugar. Bake until filling is bubbling and the biscuits are golden brown on top and cooked through, about 15-18 minutes. Cool the cobbler on a wire rack before serving. I love mixed berry cobblers. The perfect summer dessert. PS. I’m jealous that you have blueberry bushes! I agree! They’re so easy to throw together with whatever you have. Looks delicious! 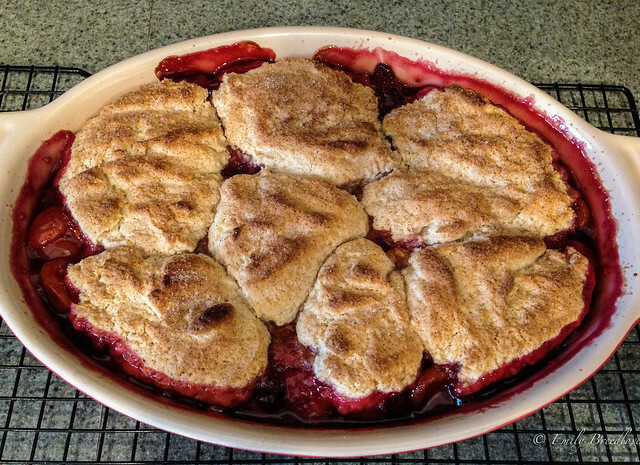 I am a big fan of cobblers, though it’s hard for me to resist eating all my summer fruit raw. I get so excited by cherry season I have to ration myself! And I am also very jealous of your blueberry bushes. The only berries I grow (so far anyways) are strawberries, and their season has ended. I am guilty of the same thing… That’s why I only had a handful of raspberries – I ate the rest! I have been missing my strawberries too, but luckily there are still a few at my farmers market.